“In the beginning, God created…” Those first 5 words found in the Bible, still bring me to a place of awe every time I pause to reflect on them. They were penned thousands of years ago, and are the explanation for, and the foundation of our existence and purpose. All of creation is God’s and those words scream out to His glory. It’s interesting to me that from the beginning, obedience was the one virtues of Paradise that God valued in our relationship with him. In fact, it is the one conditional requirement for mankind that enables us to experience Paradise. Nothing is said of love, grace, faith, humility – it is obedience that covers all. 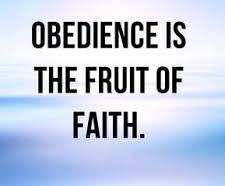 Equally supreme to the authority of God, is the demand of obedience, and it is that one thing that decides our destiny. Turning to last chapter of the Bible, we read in Revelation 22:14, “Blessed are those who do His commandments, that they may have the right to the tree of life.” Don’t miss this – from beginning to end, from Paradise lost to Paradise regained, God’s plan is unchanged: it is obedience that gives access to the tree of life, to His favor in our life, and to the fullness of a relationship with Him. God’s love for us is vast, His mercies are new every morning, and His grace is sufficient and made perfect in our weakness. Do not copy the patterns and customs of this world, but be transformed by the renewing of your mind as you reflect on God, His word, and your obedience. This entry was posted in Personal and tagged Bible, Faith, Scripture. Bookmark the permalink.